April is Genocide Awareness and Prevention Month and at Facing History, we’ve revised our seminal case study, Holocaust and Human Behavior. This revision is the culmination of five years of research, discussion, writing, and video and web production by the organization. We wanted to create a more dynamic experience for teachers and students as they grapple with this difficult history and the moral questions it raises. Why is it time for a new edition? In today’s world, how to build and maintain democratic societies that are resilient to violence is more important than ever. Not to mention that Holocaust scholarship and the study of human behavior have changed dramatically since the last revision of this work 20 years ago. So has technology. That’s why we’ve included a digital version of the new edition, along with the print version, which allows educators to build a customized experience in their classroom. Since the last edition was published in the 1990s, scholarship about the Holocaust has changed in notable ways. The opening of historical archives from the former Soviet Union has introduced new information and historical evidence about World War II and the Holocaust in Eastern Europe. Historians have also reached a more nuanced understanding of German society under the Nazis. Rather than viewing it as one in which the government had absolute and total control, it is now seen as a society where there was give and take between individuals and their government. This introduces a wider range of questions about human behavior and motivation into the discussion. For instance, while some Germans simply obeyed their government, others took initiative on their own to further the goals of the Nazis. While the choices of many were motivated by fear, the choices of others were motivated by opportunism and personal gain. The resource also includes many new readings about both the relationship between the individual and society and civic participation in the contemporary world. More than 200 readings. Over 100 historical images and maps. Three visual essays that offer collections of images organized around a theme. Plus, more than 60 original mini-documentaries and 20 video testimonies from survivors. 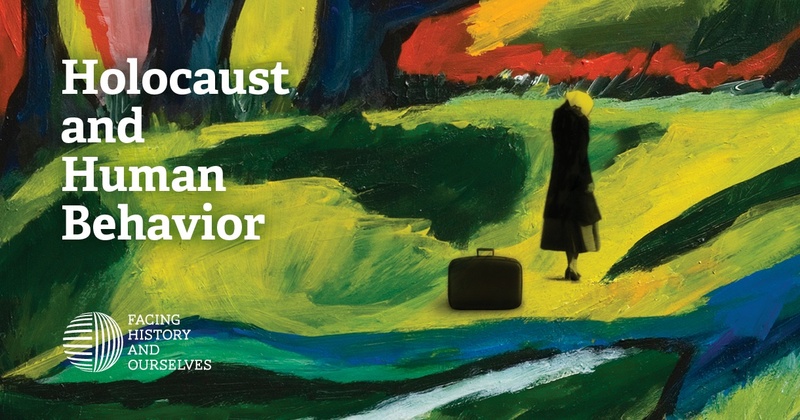 This revamped version of Holocaust and Human Behavior offers a variety of ways for you to incorporate this history into meaningful and insightful lessons with your students. Videos are cross-referenced by related readings in both the print and digital versions and they stream from the Facing History website for complete ease of use. Using the Media and Teaching Toolbox, you can easily find all of the streaming videos referenced throughout the resource all in one place. You can find sample lessons and unit outlines that provide models for curating, sequencing, and teaching with these resources in their classrooms. And, you can use our new Playlist Tool to save and organize the readings, videos, images, and other resources you want to use in your classroom. As teachers, we expect students to challenge themselves to be more engaged and thoughtful citizens. We can empower and inspire them to do this by encouraging them to confront these dark moments in history. We hope our newly revised version of Holocaust and Human Behavior, does just that for you.